Running a digital marketing campaign without analytics is a lot like throwing darts in the dark. You may get lucky on occasion, but chances are you’ll waste a good deal of time and resources. Clear and accurate data allows you to make better decisions about website improvements and digital marketing campaigns. Unfortunately, it’s easy to lose sight of analytics when you’re going through the process of a new launch or initiative. If you use Google Analytics, and most of us do, it’s easy to add the default tracking snippet and move on. But there are a number of configurations that will help you capture better data – so you can make the right decisions to make your product successful. Like Chris Mercer of Seriously Simple Marketing says, we need to “trust, but verify” the data we collect. These 16 health checks will help you audit your analytics setup to gauge where your analytics can improve – so you don’t make good decisions on bad data. 1. Are Analytics Installed on Each Page You Need to Track? You can’t track what you’re not tracking, as simple as that sounds. Depending on your website setup, it’s surprisingly easy to not have analytics installed on each page. Luckily, checking on this is pretty simple. 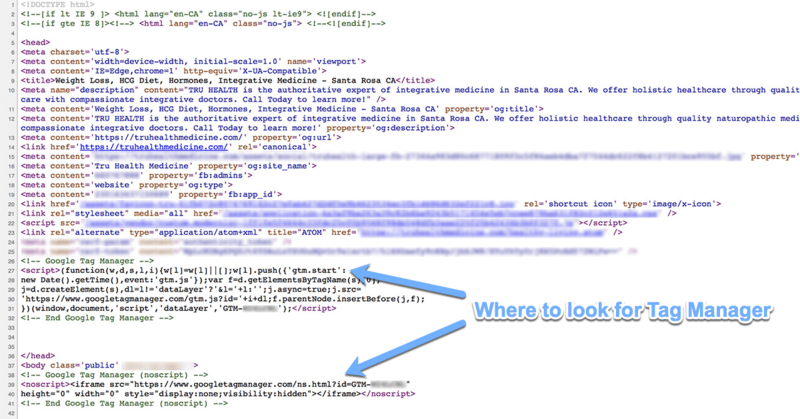 If you’re using Google Analytics, check to see if the tracking code snippet is between the <head> </head> of your code. Tip: Navigate to your website and right click the page. 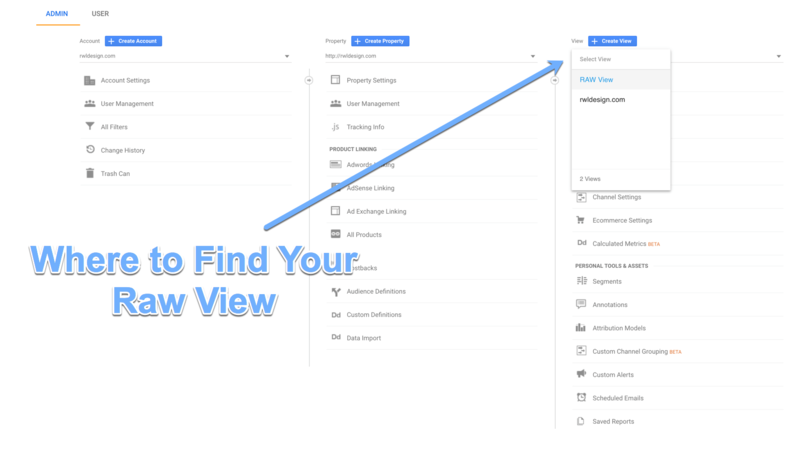 In the toolbar, select View > Developer > View Source. This will display your site’s source code. Press Control+F, type in the code snippet for which you’d like to search and press Enter/Return. Tip 2: You can also use a website auditor like Screaming Frog to easily check your code. This simple tool can search your entire site to identify pages with broken code. Screaming Frog also identifies broken links (404s) and duplicate content, which can harm your site’s rank. 2. Is Google Tag Manager Installed Correctly? Since Google Analytics was first rolled out in November 2005, it’s made substantial advancements. The first major update was real time tracking in 2011. However, things got a lot more interesting when Google Tag Manager was introduced in 2012. Not only does this laborious process take a lot of time, it can also cause errors to commonly occur. Inaccurate information skews results, causing you to be misinformed. Tag Manager simplifies this process. It allows you to easily see how visitors are using your site. In addition to making sure ‘ _gaq.push’ is within the <HEAD> </HEAD> of your source code, you’ll want to make sure an <IFRAME> with a src=”//www.googletagmanager.com is within the top of the <BODY> </BODY> of each page you wish to track. The admin settings of Google Tag Manager have step-by-step inspections you can follow. 3. Is Your Analytics Setup for Cross-Domain Tracking? Building a comprehensive and secure online retail funnel is a substantial investment. Big dogs, like AlaskaAir, Nordstroms, and Amazon have obviously made this investment. However, for the vast majority of businesses and organizations, it’s simply too expensive. The frequent solution is using a third-party to process online purchases. This means customers are actually directed to a separate domain. For example, many event vendors use Vendini to process ticket sales and many airlines use Takeflite. If you’re using a third-party site to process payments, cross domain tracking allows you to follow your customers through their entire purchase path. This is an essential element for identifying and correcting any barriers in your sales funnel. In order to determine a unique user, analytics must embed a client ID stored in the browser’s cookies. This ID is also used to successfully implement cross domain tracking. The cookie information allows Google to count the time spent on your site and the third-party site as the same session. When cross-domain tracking is set up successfully, you’ll see the external site(s) in your Hostname report (Audience > Technology > Network > change Primary Dimension to Hostname) instead of your Referrals report (Acquisition > All Traffic > Referrals) because your tracking code will be on those pages. 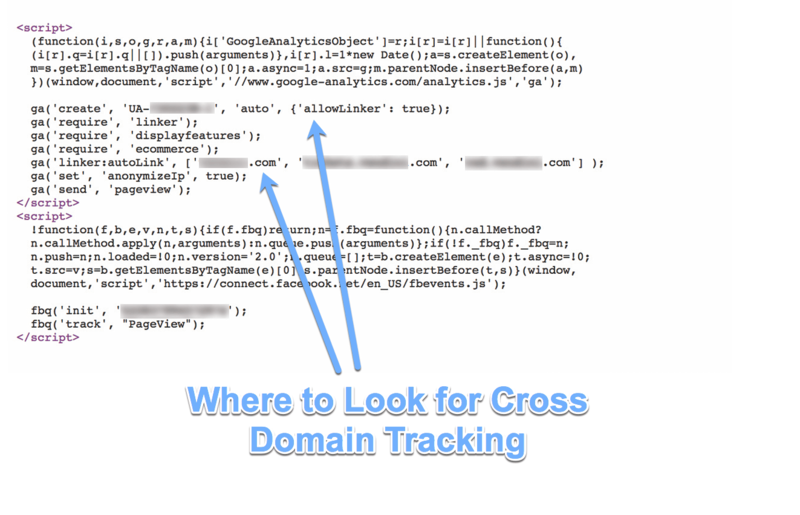 If you’re looking for more information about cross-domain tracking, this article is helpful. Tag Manager simplifies this process. All you need to do is add the desired domain and appropriate options to your pageview tag. Pro tip: There have been new laws enacted, and still more coming, about online privacy. Be sure to chat with your business’ legal team to discuss what steps you need to take to limit your liability and make your tracking optional – and understandable – to your users. 4. Is Your Analytics Setup for Remarketing? Remarketing is an incredibly clever way to connect with visitors who have shown an interest in one of your products, but didn’t make an immediate purchase. It allows you to strategically place ads throughout the internet as they browse. In Google Analytics, visit: Admin > Property Settings to see if Demographics and Interest Reports are enabled. Also, be sure your AdWords account is linked to your Analytics account via: Admin > Property Settings > Adwords Linking. With Universal Google Analytics: Check your code for ga(‘require’, ‘displayfeatures’). With Global Tracking: Just make sure that Adwords is linked and Demographics and Interest Reports are enabled. With Tag Manager: Start by navigating to Admin > Property > Tracking Info > Data Collection > Enabling Display Advertising Features to ‘True’. (Please Note: You will need to have ‘Edit’ permission to access this setting.) Once tracking is enabled, go to Admin > Property > Product Linking > AdWords Linking. This will allow you to ensure the accounts are linked in your analytics. 5. Is Your Hostname in Your URLs? Does your website use subdomains to separate large batches of content and functions? To determine this, look at the URLs associated with your site. For example, if your root domain name is mysite.com – you may have the following three subdomains: www.mysite.com, blog.mysite.com, and store.mysite.com. Here’s the key, if you are using subdomains, are the hostnames included in your content reports? It’s not uncommon for your subdomains to use some of the same URIs as your root domain (such as www.mysite.com/my-page, blog.mysite.com/my-page, and store.mysite.com/my-page). Without the hostname included in your content reports, the traffic for all these pages will be lumped together. IMPORTANT NOTE: While setting up a filter to include the hostname is important, you will need to test and potentially update your goal URLs, as they may break depending on how they were set up. Also, it’s best to add this filter on the first day of the month, as it makes for easier reporting. 6. Are You Using UTM Codes in Internal Links on Your Site? We repeat, don’t use UTM codes in internal site links. This causes a new session to be triggered for a person who’s already on your site. UTM codes should only be used on external links that bring traffic to you. Screaming Frog is an easy tool that can search for relative or absolute URLs to your domain or site, or other domains (if you are using cross domain tracking). Add or remove any improperly placed UTM codes that are found. Tracking the source, medium, and specific campaign in which a URL is used can be next to impossible, unless you created a unique landing page for each campaign. UTM codes are the solution. This piece of code snippet is attached to a URL, creating a custom URL so you can track this key data. Google has a great tool for creating UTM codes for a URL. 7. Are You Filtering Employee and Contractor Traffic? Whether it’s employees checking information on your FAQ page or your web designer testing a new site update, traffic from these individuals can skew your analytics. To avoid this, you’ll want to filter in your Google Analytics to exclude traffic from those specific IP addresses. LunaMetrics shares a list of other filters that may potentially be helpful. Not all filters are right for every website. To determine which filters are right for your site, you need to take a look at your goals and how the site is being used. You’ll also want to pay attention to the order in which your filters are applied to ensure they make sense. 8. Do You Have a Raw View in Analytics? There are a variety of ways you can filter your analytics, but sometimes all these filters can make it difficult to know if your tracking is actually working how you want it to. A ‘raw view’ or ‘default view’ is a view that shows data without any filters set or goals applied. To create this ‘raw view’ go to: Admin > Property > Property Settings > Default View > Save. Applying filters is an exceptional way to parse data into useable chunks. However, it’s important to make sure your analytics and your filters are working correctly. A ‘Raw View’ allows you to do this, by tracking your data without any filters applied. Pro Tip: While you don’t want to apply any filters to your ‘raw view,’ we do recommend linking AdWords and turning on Ecommerce tracking if you are using them. If you don’t take these two steps, then you won’t have all the necessary data. 9. Are You Tracking Your Error Pages? Google will only index a certain number of your site’s pages. You don’t want the indexed pages to be consumed by error pages. This can substantially hurt your rank. Plus, frequently displaying them isn’t good for user experience. Third-party services like Rollbar and Sentry can help you monitor for errors, so they can be quickly fixed. Errors can be as simple as a misspelled redirect. It’s easy to have happen. The key is to get it corrected quickly. 10. Are You Tracking Site Search? View Settings > Set Site Search Tracking to ON > Enter the parameter(s) that indicate(s) a site search > Enable categories > Enter the parameter(s) that indicate(s) a category search > Apply. NOTE: Most sites will only have one parameter. However, if you have multiple search fields then you’d have more than one parameter. For example, an online clothing store’s parameters might include size, color, and gender. It’s also worth using a filter to force search terms to lowercase to avoid duplicate terms tracked. 11. Do You Have Proper Goals Setup for Conversions? URLs – This goal is triggered when a visitor lands on a specific page. You may use this kind of goal is best reserved for a thank you page triggered when a visitor buys something or opts into something. Time (Visit Duration) – This goal is triggered when a visitor stays on your site or a specific page for a predetermined amount of time. Websites may want to use this goal when they’re focused on educating visitors. Pages/Visits – Similar to Time, a page goal is determined by the minimum number of pages you want a visitor to view before leaving your site. Traditionally speaking, the more pages a visitor views, the more likely they are to convert. Events – Event goals are a tad more complicated to set up, in that you must first create an event. Events could include clicking an external link, downloading a document, watching a video or clicking on a social media widget. 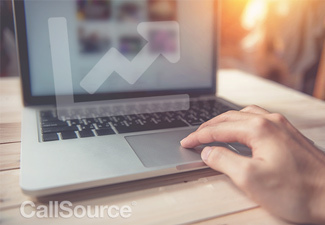 ECommerce Tracking – when set up correctly, you can send product and anonymous purchase data like price and purchase time to Google Analytics to help you monitor purchase behavior. 12. Is Your Home Page Setup Correctly in GA? You may have multiple versions of your homepage to better serve visitors from different countries. For example, you may have a French version, which lives at: mysite.com/fr. It’s important to specify one authoritative version, so you can accurately track its performance and your other versions. This authoritative page is specified within you Google analytic settings. However, if this authoritative page is set incorrectly, it can cause some serious problems within your analytics. These problems include breaking filters, breaking conversion goals, and diminishing your Google rank. We always recommend working with a web professional to accomplish this task. Also note, if your homepage is just mysite.com/ then you can leave your default page blank. 13. Have You Turned on Bot Filtering? Turn on Bot Filtering. If you don’t filter out bot traffic, it can substantially skew your analytics, giving you an unrealistic picture of how your site’s performing. This task should be filed under, “No brainer.” Simply navigate to Admin > View > Select view from drop-down menu > View Settings > Bot Filtering. Pro Tip: If you are using an uptime monitoring service (like pingdom ), check to see how they are testing your site. The Google bot may not pick up all of their traffic. Depending on the test, the service may try and simulate how a person accesses your site. It could require a seperate filter to remove this traffic. 14. Do You Have Your Time Zone Setup? An incorrect time zone or territory can render your reports confusing, at best. To check your time zone setting navigate to Admin > Profile > Profile Settings > General Information > Select the appropriate time zone > click Apply. 15. Have You Added Your Social Settings? Social media can be an amazing source of free traffic. Unfortunately, without the right filters in place, it can be hard to know which platforms are performing the best. To check that you’ve listed all of your social properties (social media accounts), navigate to Property > Social Settings. You should see all of the platforms on which you participate listed. 16. Have You Recently Reviewed Your User Permissions? Employees and contractors can come and go. When they go, most of us think about taking things like employee badges and company computers. However, it’s not uncommon to overlook their permission settings. Take a moment to review who has access to your analytics account and what level of permission settings each individual has. Are there any individuals who need to be removed or their permission status changed? To do this navigate to: Admin > Account/Property/View > User Management. Even the best of staffs can struggle to identify where a call originated (where the caller found your number). This can make it incredibly difficult to track which promotion is really driving leads and delivering a quality return on investment (ROI). Dynamic phone numbers (like the ones provided by CallSource) simplify this process because they allow you to pinpoint the specific ad from which the number originated. We’re particularly fond of using dynamic phone numbers in video ads, as it helps us to maximize our adspend. Looking for more ways to strengthen your online presence? Learn how to claim the coveted ‘Spot Zero’ search rank. At RWL Design, we invest a lot of time and resources making sure our team stays focused on helping our customers make sure their analytics improve. Even still, there are always new ways to make it better. Data is important, especially as your business grows to the point that can sustain and utilize A/B testing. But without the right tracking, you won’t have the data to understand the successes and barriers that users face while using your product. Without that data, you’ll have a much harder time making the improvements that really matter to your customers’ success and your business goals. Try these 16 checks to see if there could be shortfalls, or hire an agency to help you. It’s a good investment. If you can any questions, reach out to CallSource or RWL Design on Twitter.